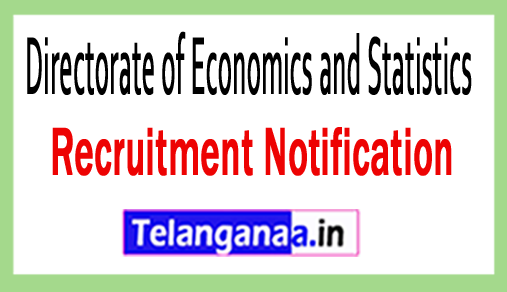 A vacancy notification designated as DES recruitment has been attracted by the Directorate of Economics and Statistics for informing enthusiastic and talented applicants for 329 vacant posts of Research Officer, Research Assistant, Statistical Assistant. The eligible person can apply for DES vacancy by submitting the application form till the end date of 7th September 2018. Academic Description: Aspirants should complete the education as a graduate degree / postgraduate degree (commerce / mathematics / economics) with good academic records from a well-recognized university / institute as per applicable posts. The maximum age limit for candidates applying for the application is 37 years. Monthly remuneration: Successful recruitment candidates will get Rs. Rupees. 38,000 / - (post 1), Rs. 35,000 / - (post 2), Rs. 28,000 / - (Post 3) from recruitment organization. Candidates' engagement will be based on their performance in written examination / interview, which will be conducted by the Recruitment Committee of Directorate of Economics and Statistics . The first and necessary steps of participants are to go to http://gujecostat.gujarat.gov.ins official site of the organization. Once the applicants successfully fill the application, the applicants should submit to the address given below for the closure given below. The expiration date for offline submissions is end date: 07-09-2018. Click DES recruitment notification here.